This is the third batch of church visits that I’ve blogged about. You can read about 1-10 and 11-20 as well. 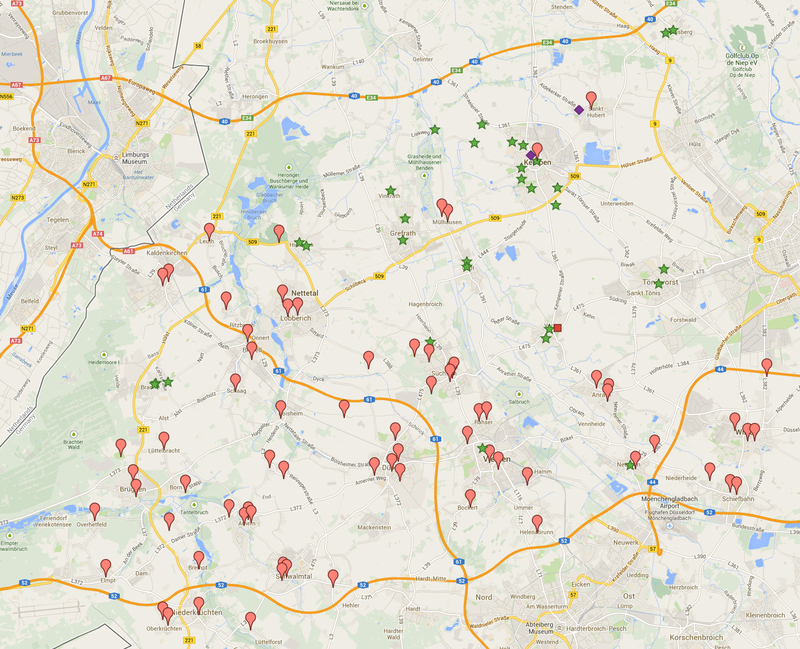 So this is the map of all 30 churches visited so far. 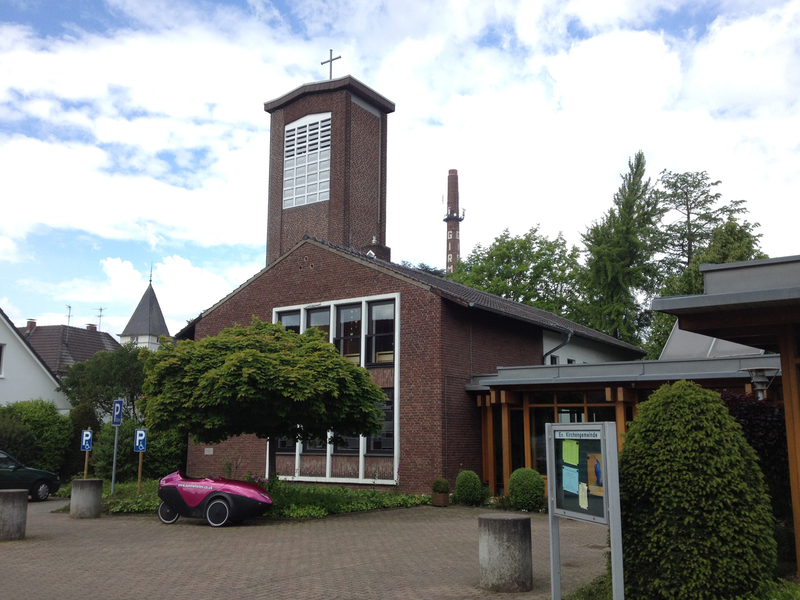 I visited this church on Tuesday 14 May, also visiting churches in Tönisvorst on my way to Oedt. 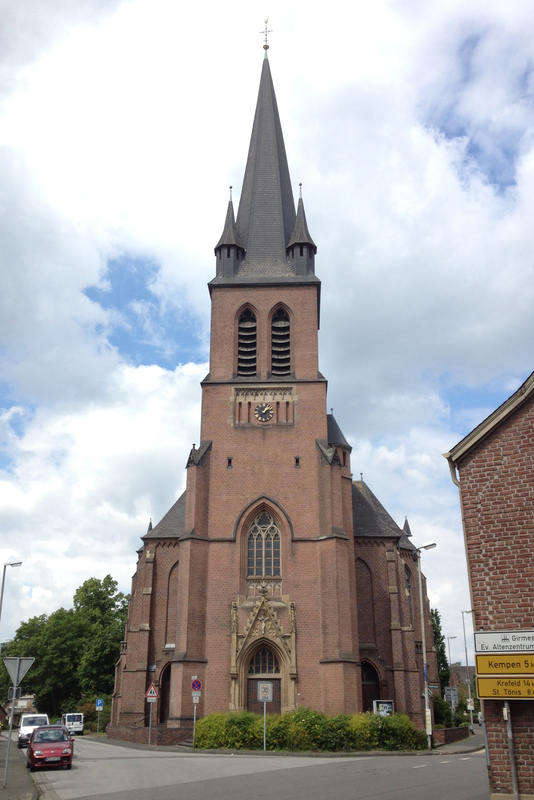 St Vitus was yet another blindingly-obvious church in the centre of the small village of Oedt. It seemed like an enormous church although was built right beside a fairly busy road which made it rather difficult to park Penelope near it – she ended up at the side, being dwarfed by the building. The church itself was built between 1901 and 1903 although the tower wasn’t begun until 1910 due to lack of funds. It was completed in 1912. 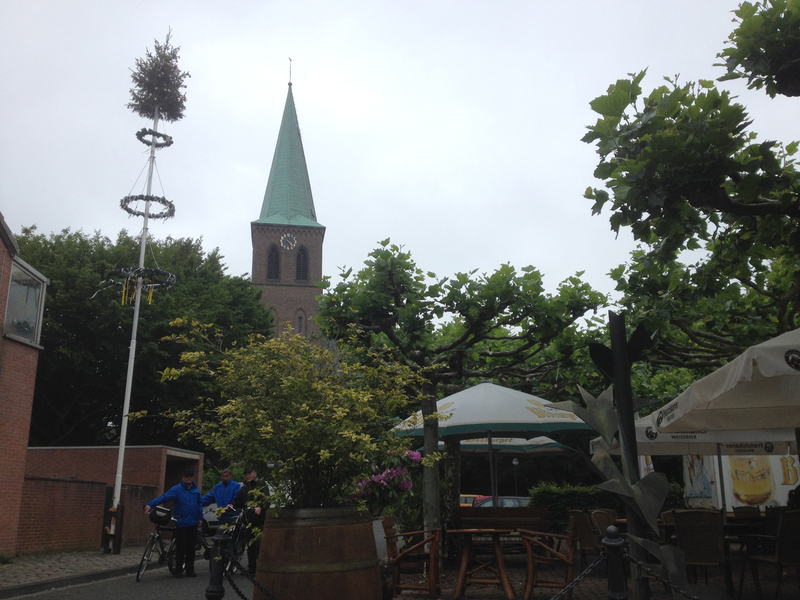 As I was cycling towards Tönisvorst on the start of this little journey I could see a church spire and a bit chimney close to each other – it turns out this was Oedt. No doubt the chimney is a very useful landmark for the locals – it’s visible in this photo. The chimney is for the company of Johannes Girmes & Co, founded in 1879. 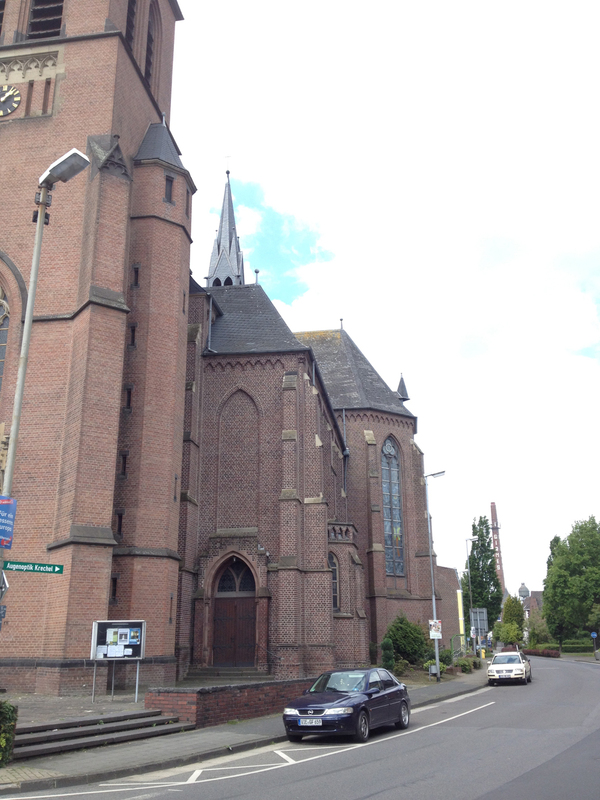 This is the Evangelische church for Oedt and was less than 200 metres from St Vitus. You can see the Girmes chimney in the background as well. The church had a plaque on the front that showed it was built in 1957. 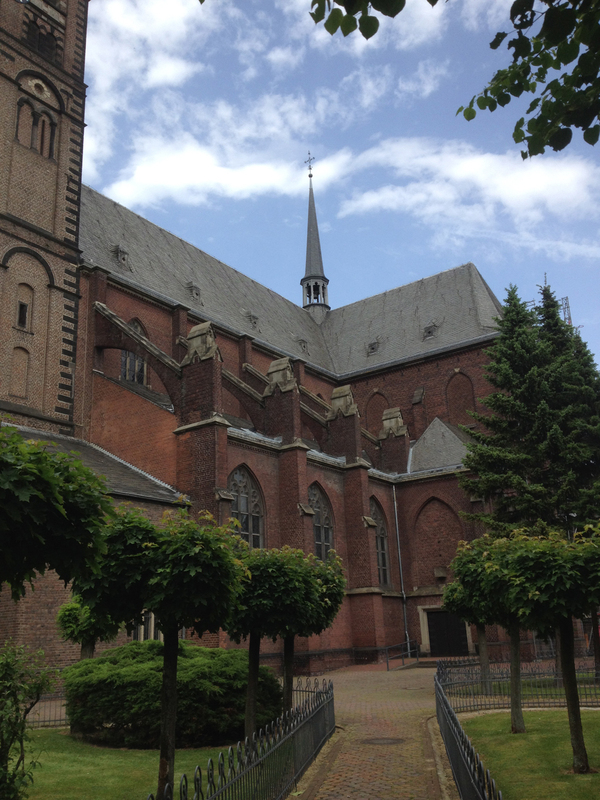 I think I prefer the red brick look to the white concrete of most of the other Evangelische churches I have visited so far. I tried the door to the right hand side of the church and, lo and behold, it opened! There was this painting that I rather liked as you walked in the door. There was a lady pottering about in the kitchen to the side and she came out to see me. I explained I was visiting lots of churches and asked if I could have a look inside the main sanctuary. She said of course, took out some keys (it was locked) and unlocked it for me so I could have a peek in. 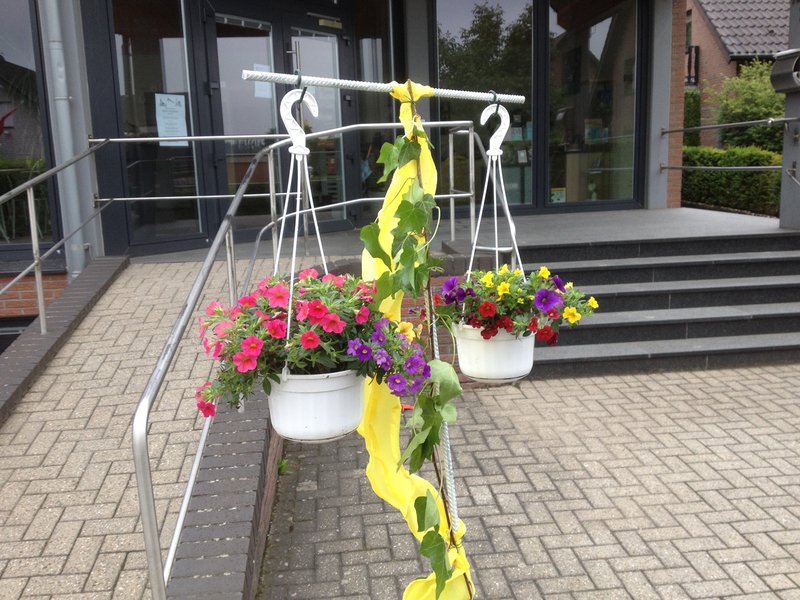 I asked about the white ribbons on the chairs – were they for a wedding? She said no, for their confirmation service which was taking place this Sunday. 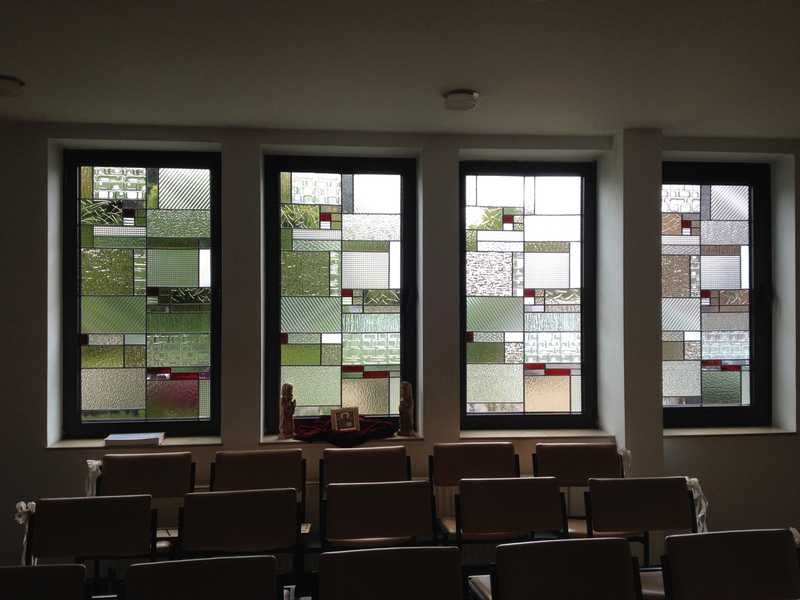 The church had some very faintly-coloured windows. 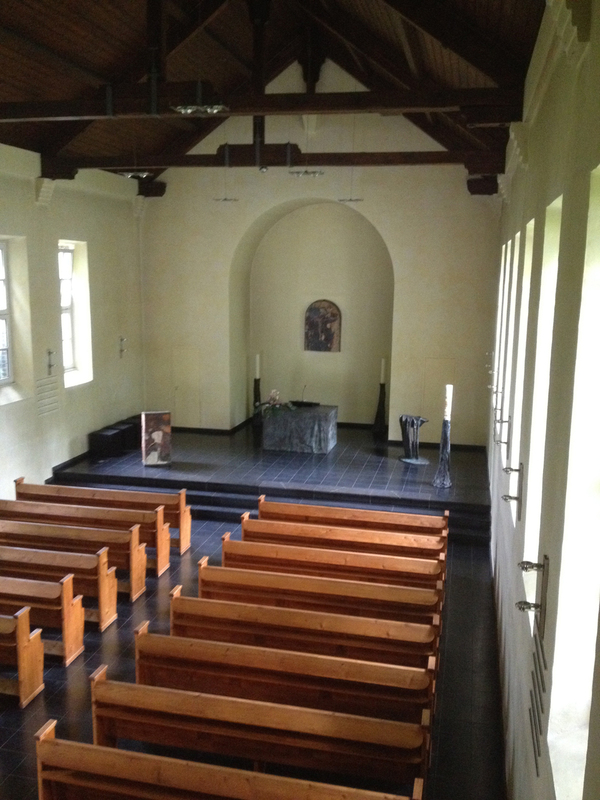 The lady then decided to show me around the rest of the church – it has several rooms which she said they let out to lots of groups in Oedt. 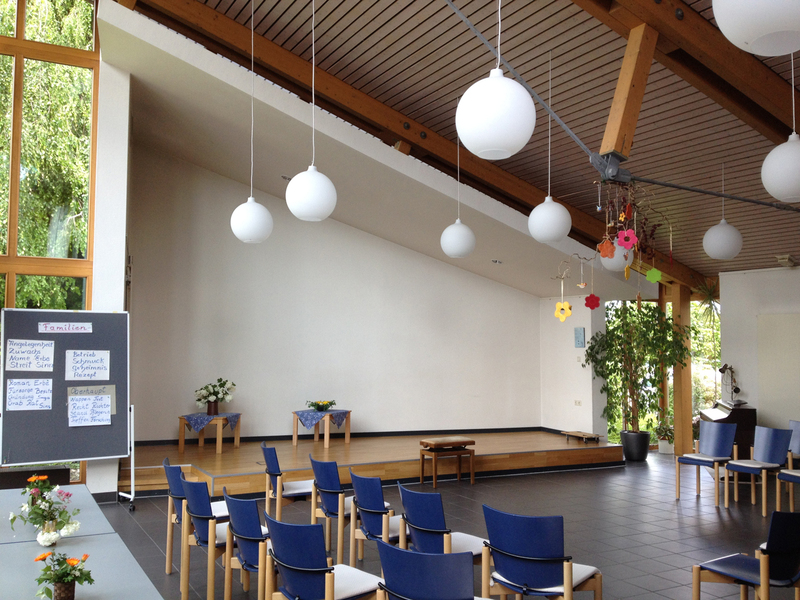 This was the main hall – it was prepared for the choir practice later that evening. I commented that choirs seemed really popular in churches. She thought it odd that most UK churches don’t have one. I guess it depends what you’re used to but I, for one, like the fact there’s plenty of chance to join a singing or other music group in Germany. She then showed me another room which had a divider from the previous room (but the whole area could be opened out). 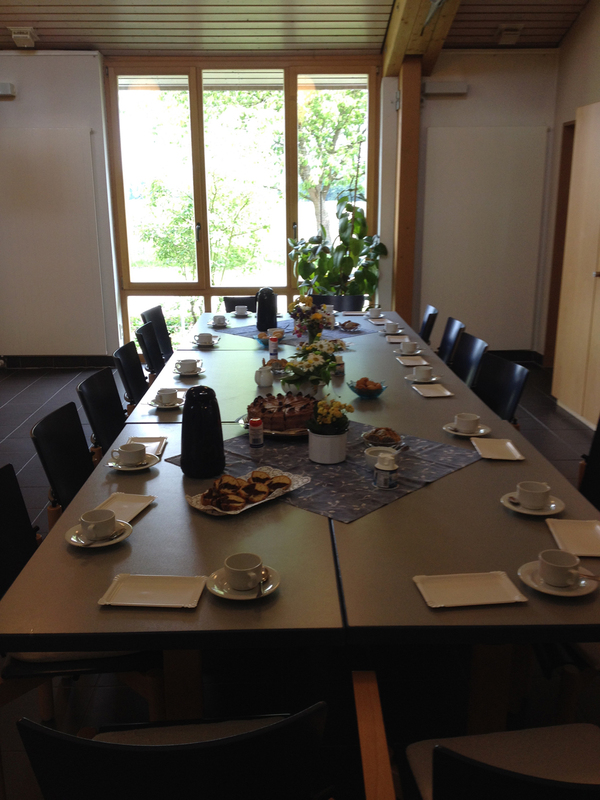 This was set out for a social tea and cake afternoon that would be happening there shortly. And, yes, there was a black-forest gateau on the table. I left without stealing any! The lady told me she was 82 and still very much involved in the church. It gave the impression of a place that was well used which was nice to see. 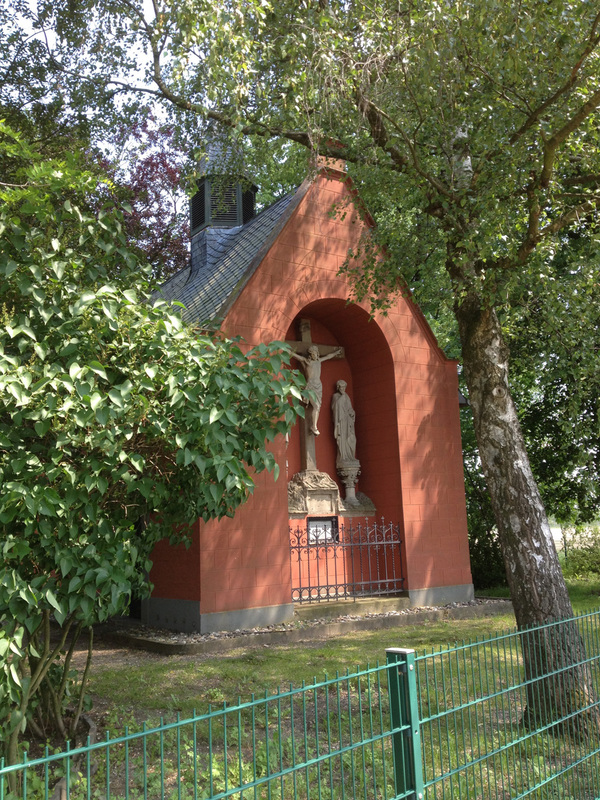 I visited this very small chapel on the way back from a random cycle ride to Krefeld. 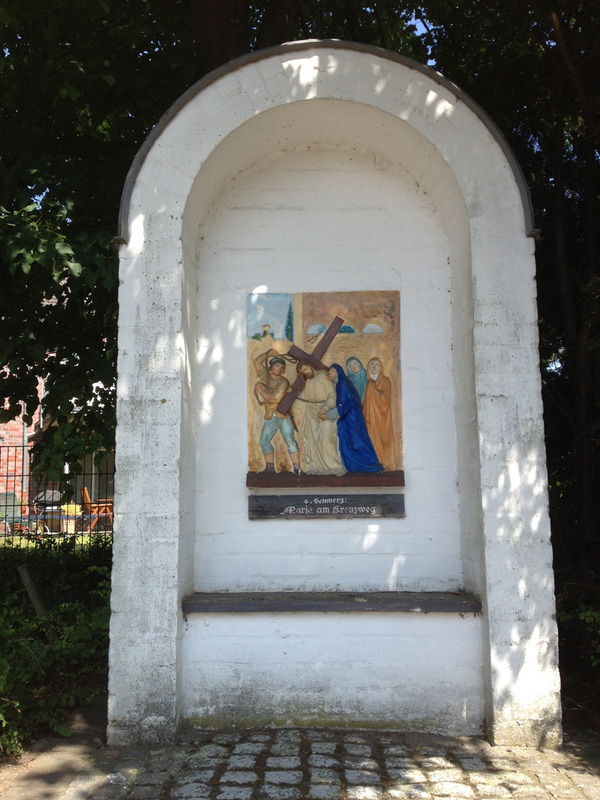 The track I’ve included is from the Kreuzkapelle home, rather than the wiggly track of my outward journey as well. 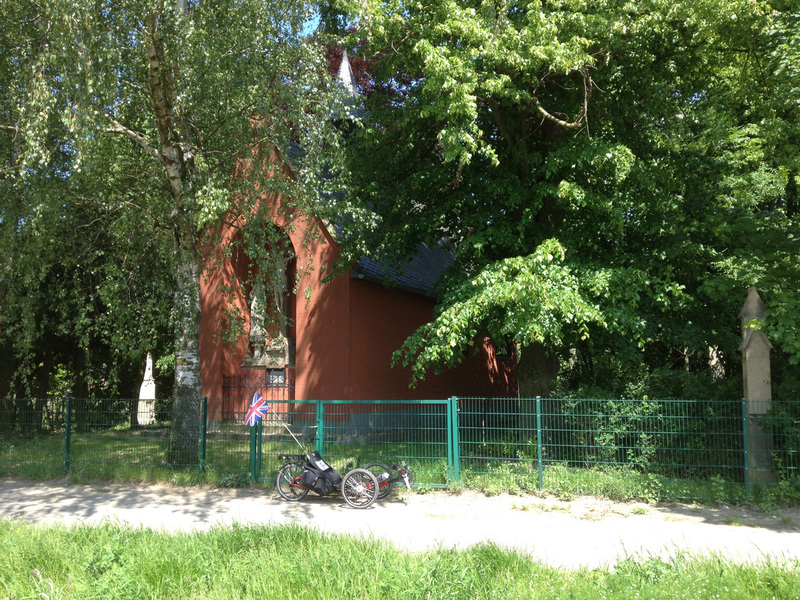 The Chapel is situated on the edge of what is currently a building site for new homes on the south side of Kempen. I realised I was in the right place, though, because of the name of the road – Alter Prozessionsweg. 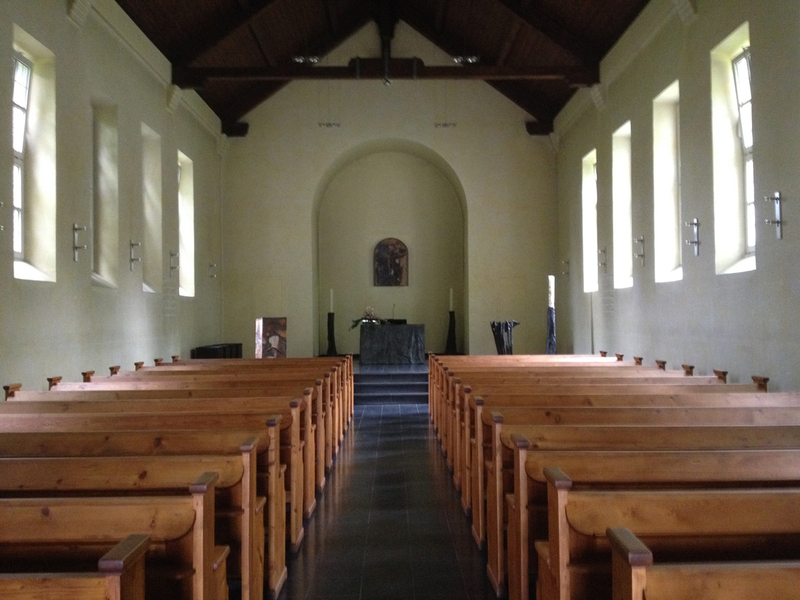 The chapel was originally built in 1639 according to an inscription in the main door. 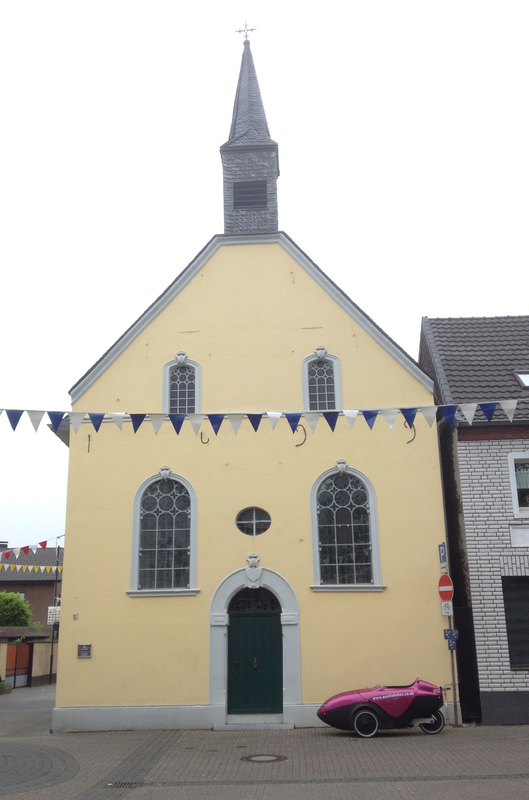 The chapel was also mentioned by the Kempen chronicler Johannes Wilmius (1584-1655). It’s currently only open on Good Friday and for other special events – and it was most decidedly closed when I got there. The gate in the fencing around the chapel was locked and it was all quite overgrown so hard to see. 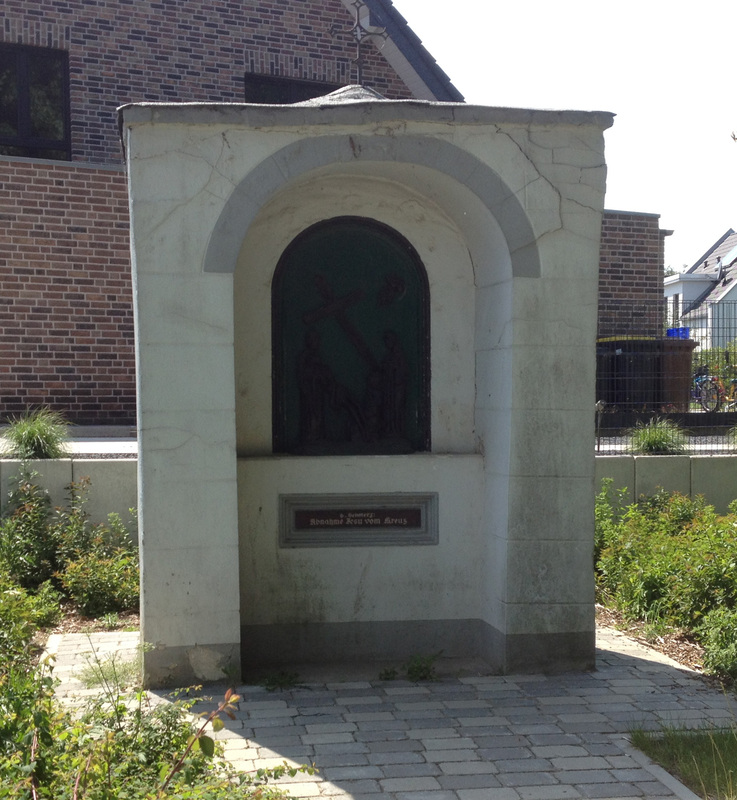 It also serves as the 12th Station of the Cross, apparently – I spotted two others on my ride into Kempen but haven’t been able to find out any more information about them. 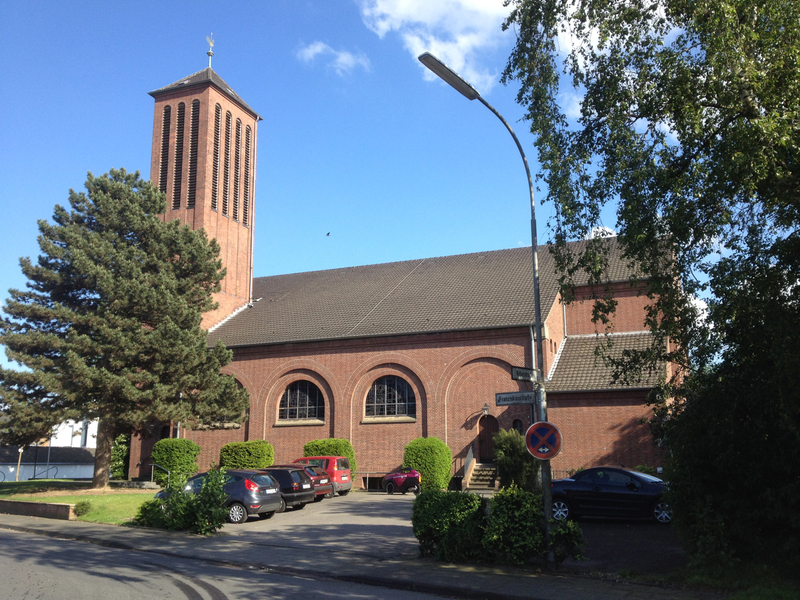 I decided to visit the two churches in Sankt Tönis (part of a general area called Tönisvorst) on the 22nd May 2014. 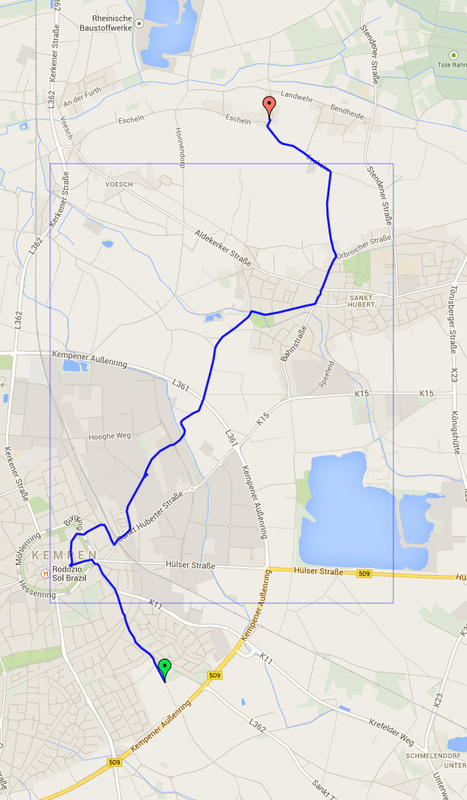 This was my route to these two churches from home. 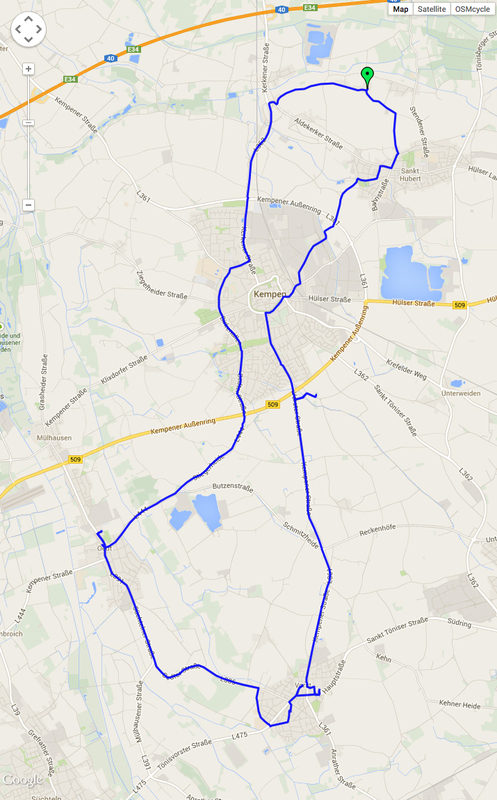 As you can see, on the way back I diverted through Krefeld-Hüls (to have a slice of cake and to have more of a variety of roads for the journey). 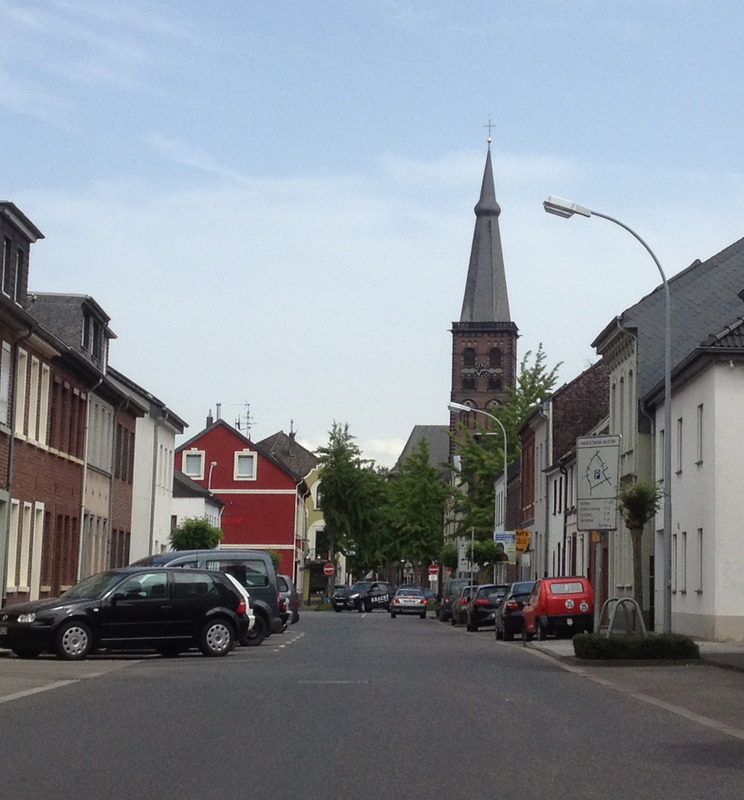 St Cornelius is the church that you can see from a long way away as you approach Tönisvorst on the Landstraßen, although once you actually get into the town you can’t see the whole building. 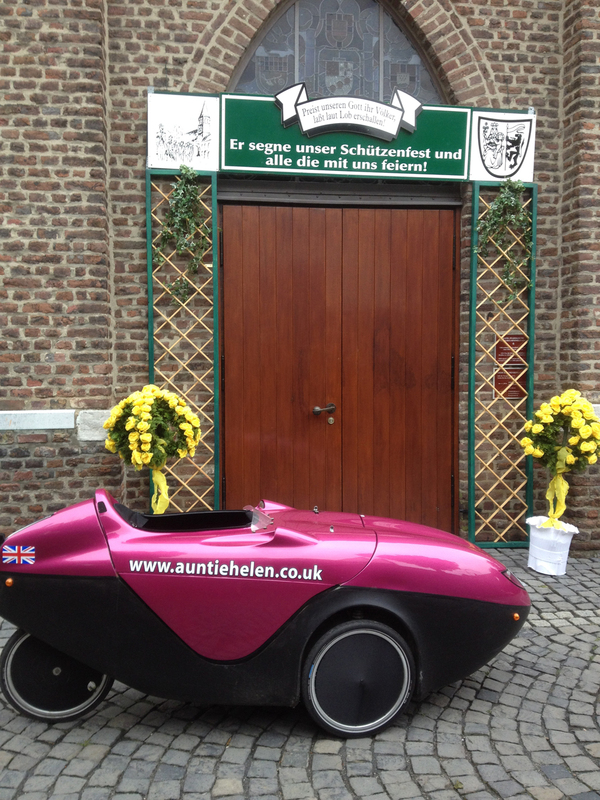 Here is the obligatory photo of Penelope outside the church. There has been a chapel or church on this site since 1380. Part of the current tower dates from 1483 but it was mostly rebuilt in the middle of the 19th century, with the rest of the neogothic brick basilica built from 1903. There was some damage in the second world war which was repaired fairly quickly. As usual the church was locked (I guess the problem with the catholic churches is the expensive decoration within that can’t be left for random people to pinch bits!) but I was very impressed by these flying buttresses on the side! 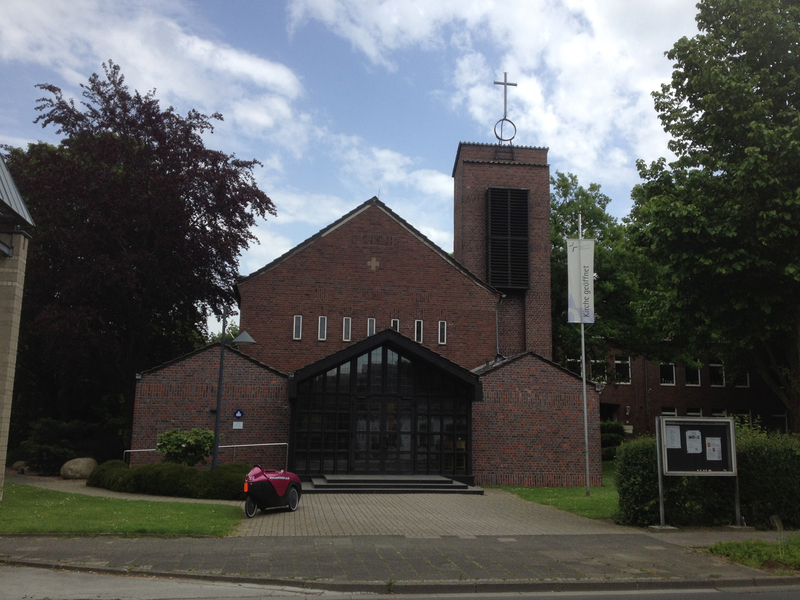 This church was just a short distance from St Cornelius (which was slap bang in the centre of Sankt Tönis), along the road that leads out towards Krefeld. 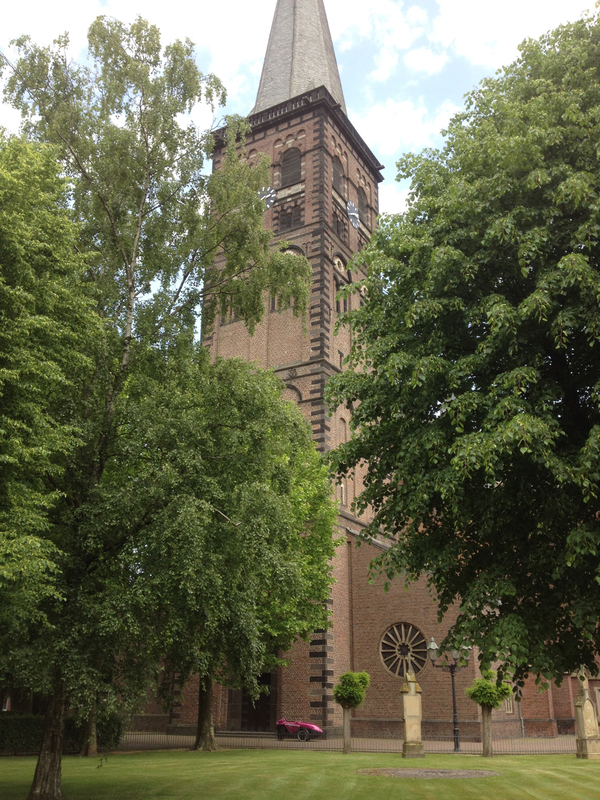 The flag that is flying to the right of the tower says ‘Kirche geöffnet’ – and indeed it was open! I walked up to the balcony to have a bit more of a look. You can see how plain these Evangelische churches are. In some ways I quite like it but it doesn’t always feel that warm. Outside was the now-familiar bell tower out on its own. 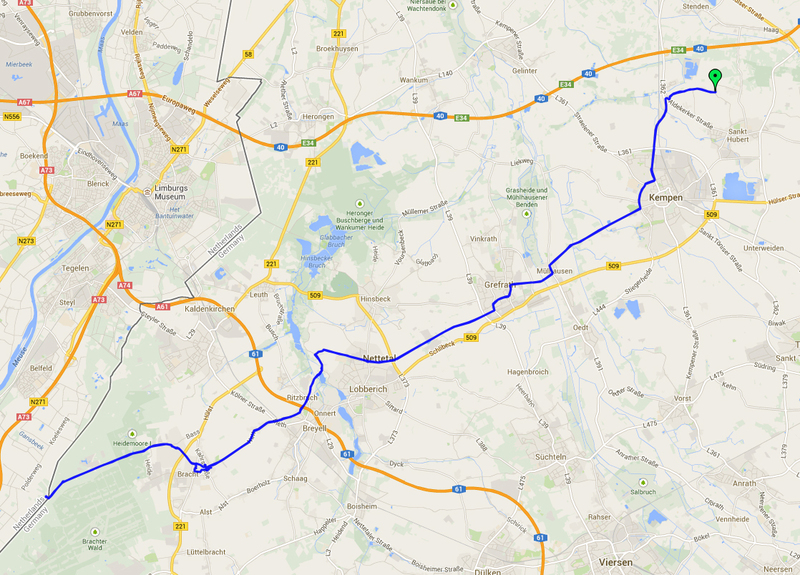 I wanted to cycle to Viersen to check out the VHS (Volkshochschule, a kind of adult education college) so headed off on the 45km round trip. 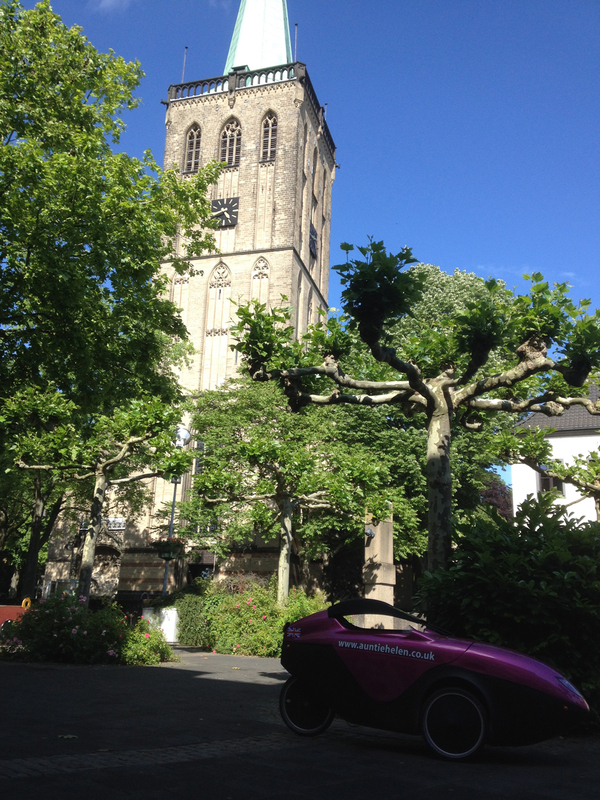 As I passed right by the main church in the centre of Viersen, St Remigius, I decided to stop and have a quick look. Here’s my track for the day, including an unfortunate diversion when I made the mistake of following official cycle route signs! Anyway, here is St Remigius, a rather attractive light-coloured church but one which it was impossible to get in the frame! There was a nice pedestrian square outside the church but it was still impossible to get a view of the whole building! As Penelope wasn’t in the last two shots I decided to get a picture of her whilst eating a cake at a café which faced the church. I couldn’t find any historical information about this church on the website or elsewhere, unfortunately. 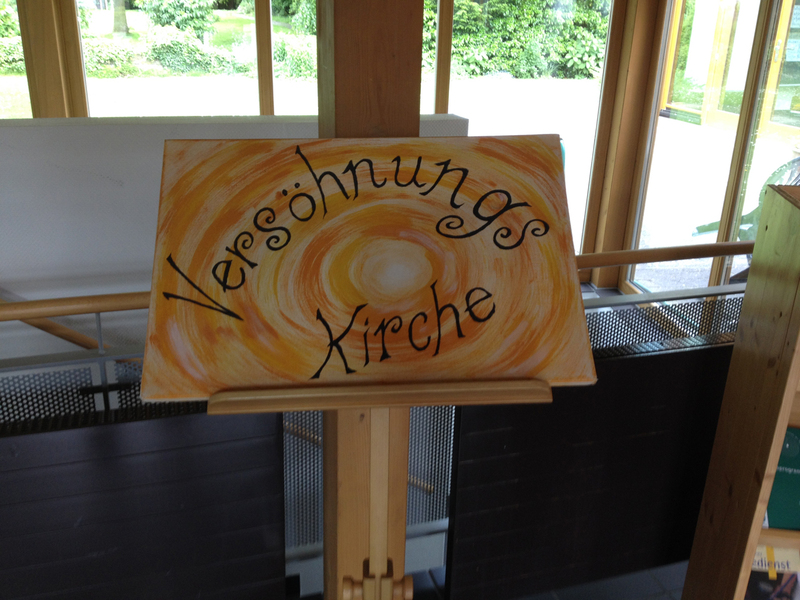 Maybe some locals to Viersen can tell me a bit more about it! As part of my unexpected diversion I cycled right by this church so stopped to take a photo. There were a few children hanging around outside this church on a Friday afternoon and I see from the website that there’s a kindergarten affiliated to it (although these children were too old for that), so it seems as though they have some events for youth as well. However, once again I couldn’t find out any information about the history and buildings of this church on their website. 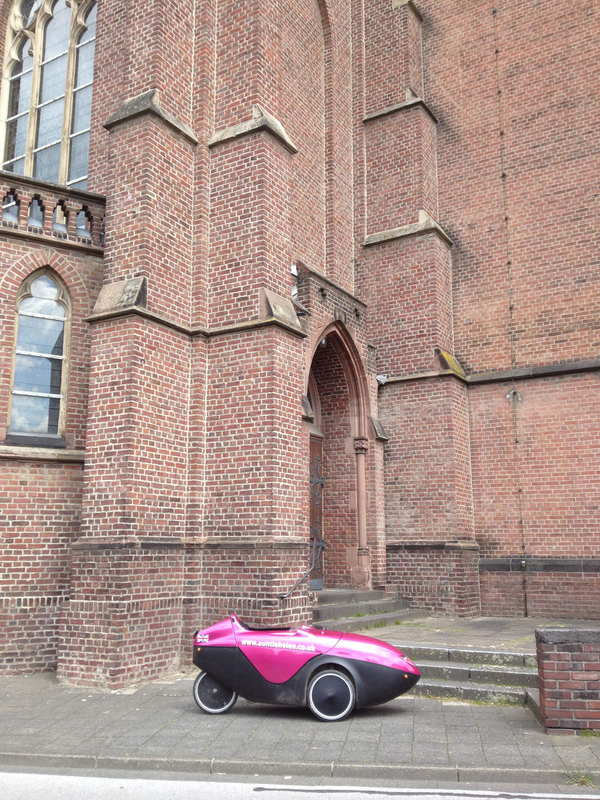 I visited this church, and the two others in Bracht, on the way back from a gathering of recumbent trikes and velomobiles just over the border in the Netherlands. 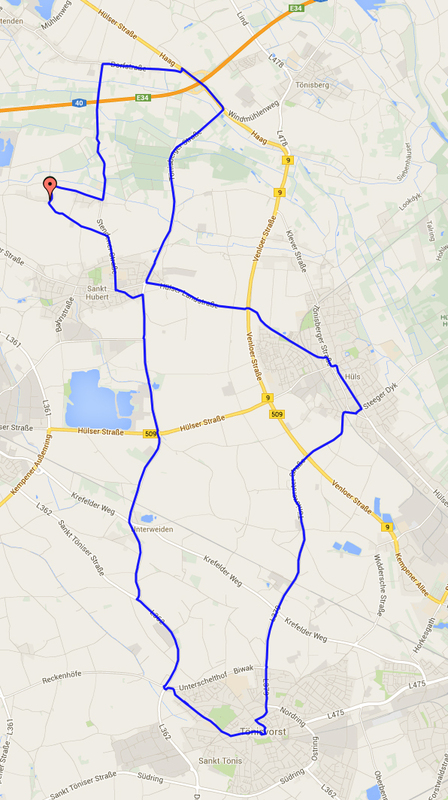 Here’s the route for the ride to Bracht. St Mariä Himmelfahrt (which I visited on the day of Christi Himmelfahrt which seemed fitting) was another of the churches that are set in the centre of the town with buildings clustered around it. It was therefore impossible to get a photo of the whole church. 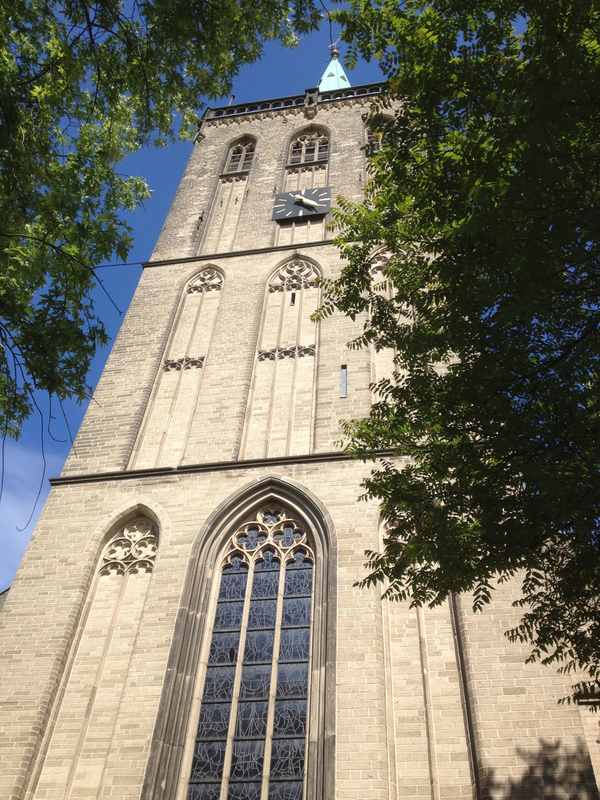 I caught this glimpse of the tower above a beergarden. Here is Penelope outside the front door. There seemed rather a lack of information about this church on the website – well, there was plenty of info about events taking place there but nothing much about its history! 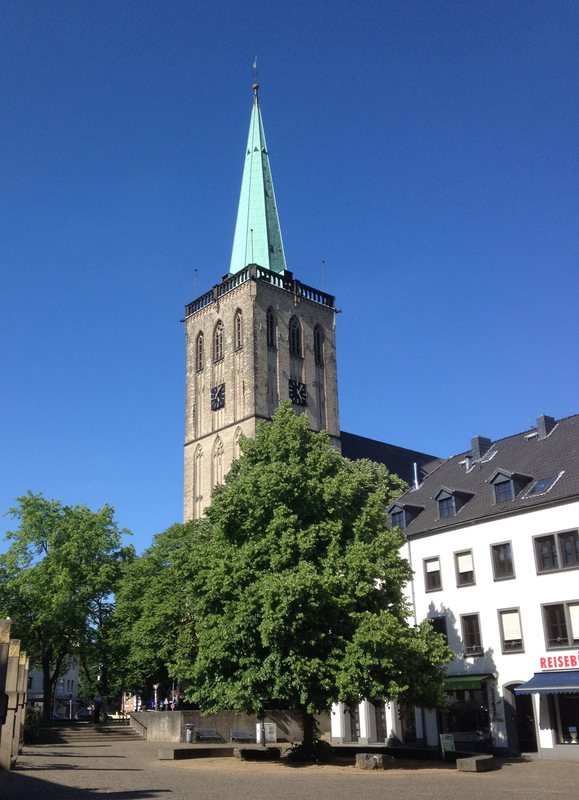 Just along the main street from the Catholic church was the Evangelische Kirche, looking initially just like one of the other buildings and houses along the road except for its spire. It had this plaque on the wall with a short summary of its history. 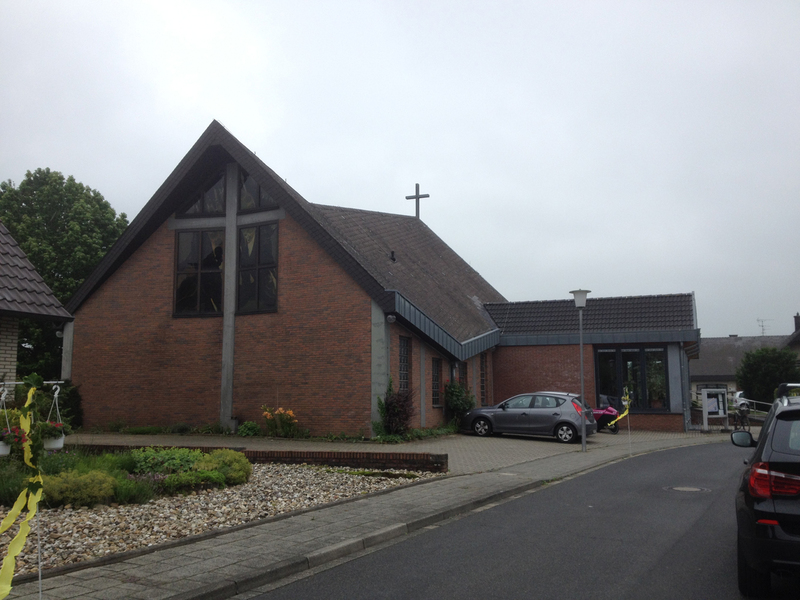 This church is a baptist church (the first I’ve seen on my travels in Kreis Viersen, which is interesting compared to the UK which has a lot of baptist churches). 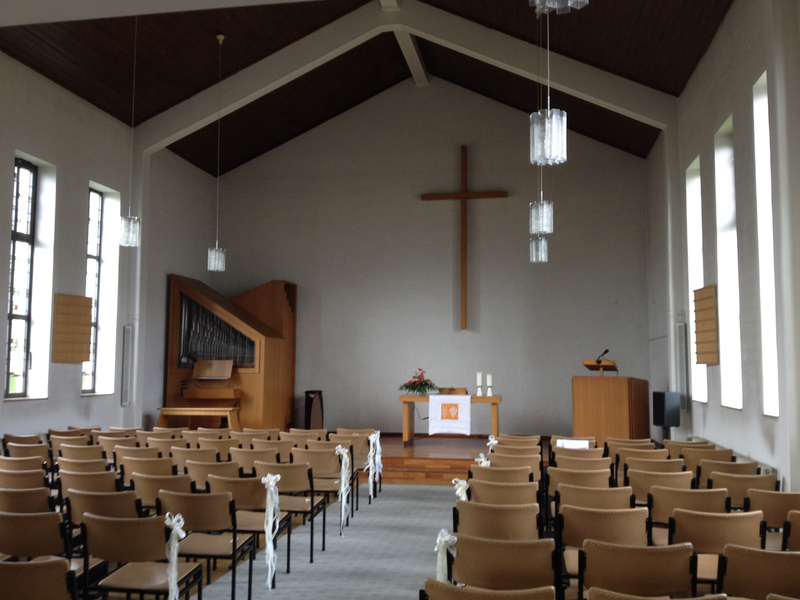 The church has been in Bracht for 30 years and, as a free church, is not part of the state system. Their website says “membership of our church is of your own free will”. What this also means is that they don’t get church tax money so rely on the congregation to financially support them. They have a pastor and a couple of other church workers. 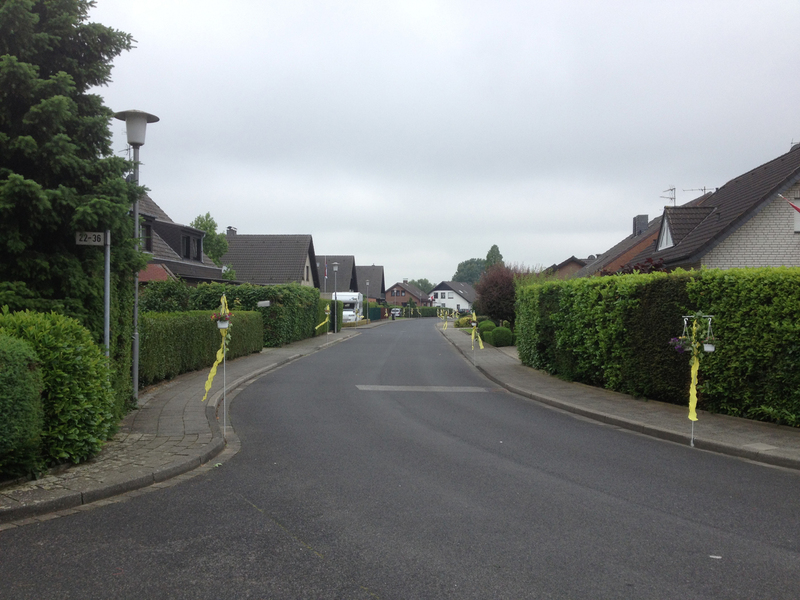 On the day that I visited, Christi Himmelfahrt, the whole road had been decorated! A look through their website gives the impression that this is very similar to a lot of the baptist churches in the UK, of the more conservative angle. Moin, ich lese Deinen Blog sehr gerne. Vielen Dank für den englischen Blick auf die deutsche Lebensweise. Deine Erlebnisse und die Berichte sind immer wieder nett zu lesen. Mir ist aufgefallen, dass zum Teil die Bilder nicht dargestellt werden. Vermutlich liegt es an den Dateinamen die Umlaute enthalten. Das ist mir auch schon bei den anderen Kirchenbildern aufgefallen. Vielleicht kannst Du da nochmal nachsehen. Thanks for the comment Stefan. The pictures all display OK on my iMac but I’ve just checked with my iPad and the ones with Umlauts don’t. How weird! I will see if I can change the titles of the photos so that they show OK. I think I have fixed most of these – it’s not easy to search for them! It was indeed a problem with Umlauts in filenames so I will ensure I don’t use those in the future. 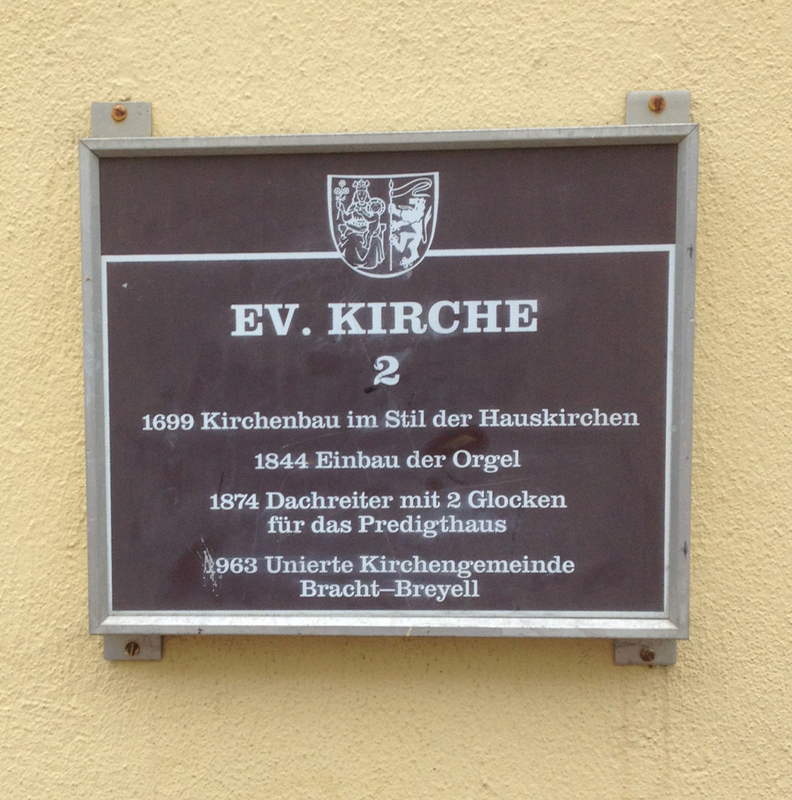 Was man im Kreis Viersen sehr schön sehen kann ist die historische Entwicklung der Glaubensgemeinschaften; Nach dem Krieg kamen offensichtlich sehr viele Vertriebene aus dem protestantischen Osten in diese Gegend die fast durchgängig katholisch geprägt ist, daraus entstanden die kleinen und schlichten evangelischen Kirchen die fast alle erst einige Zeit nach dem Krieg gebaut wurden. Dort, wo in Deutschland die Reformation Fuß gefasst hatte ist es genau umgekehrt. Interessant auch, daß es viele Bauten gibt die um 1900 im neogotischen Stil errichtet wurden und sich recht ähnlich sind weil sie sich an den gleichen Vorbildern orientieren, bzw. 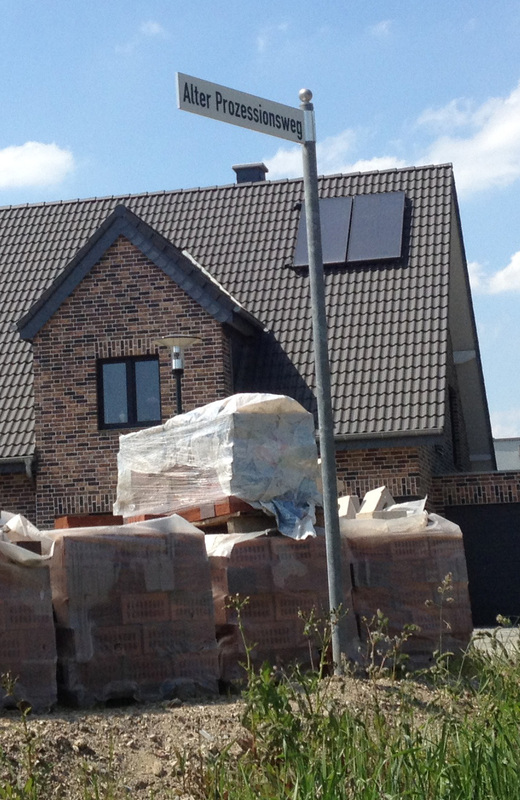 auch von den gleichen Architekten entworfen worden sind. You should ask my daugnter. She made a report about the Remigius Church last year in school.